Joker writer-director Todd Phillips is on a photo-releasing streak, having recently uploaded a picture of lead actor Joaquin Phoenix on set of the gritty and experimental film. 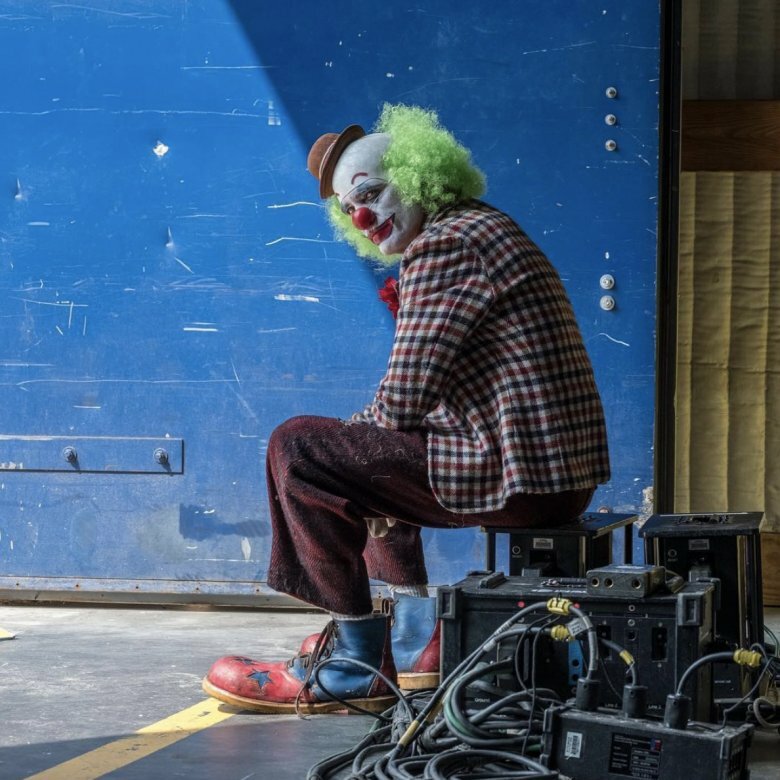 Shared to Phillips' Instagram account with the caption "Work," the snap features Phoenix not as the Clown Prince of Crime in the way DC Comics fans know him but as a clown — one that looks down in the dumps and displeased with his occupation. In addition to a frowning face, he wears a headpiece with green wrap-around afro and tiny top-hat attached to it, a red and blue checkered jacket, dirty red trousers, and enormous shoes with stars cut out of the toe. Of course, the get-up includes the ubiquitous bulbous red clown nose, a water-squirting flower affixed to his jacket pocket, and exaggerated makeup. This look at Joaquin's character in Joker looks quite different to the — dare we say it – suave Joker seen in other set photos that leaked online over the weekend. In those pictures, the Joker rocked a three-piece suit, makeup that was less hokey and a bit more left-field, and darker green hair worn in a much cooler style. His demeanor was lively and mischievous, as evidenced by Joaquin laughing and smiling in the photos. Here, though, his character is markedly dejected — and that's likely because he hasn't found his calling in life and has yet to transform into the Joker. 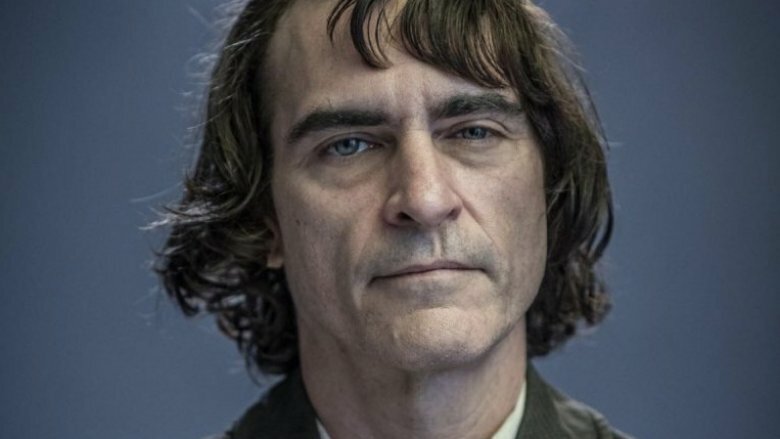 Rather than centering on Gotham City's resident hoodlum in his prime, Joker will chronicle the rise of the man who becomes the Joker: Arthur Fleck, a stand-up comedian who tries and fails to make a career out of telling jokes, and who turns to a life of crime after audiences reject him. Bearing this in mind, one could theorize that perhaps Arthur ends up taking a few odd jobs to make ends meet after his dreams of being a bonafide funnyman go down the toilet — including working as a clown. Something specific has to have pushed Arthur to snap and pursue villain-hood as the Joker, so maybe after being called a clown at the comedy clubs and hamming it up as an actual clown at a few children's birthday parties, Arthur takes his feelings of inadequacy and anger and blends them with the jester-esque aesthetic to mold his alternate persona. In any case, this probably won't be the last time fans will see photos of Phoenix from behind the scenes of Joker. Phillips seems to have taken the Ron Howard approach to building hype for the movie, so if you have yet to give the filmmaker a follow on social media, you'd be wise to remedy that right now. Can't go missing an exclusive Joker pic, now can you?